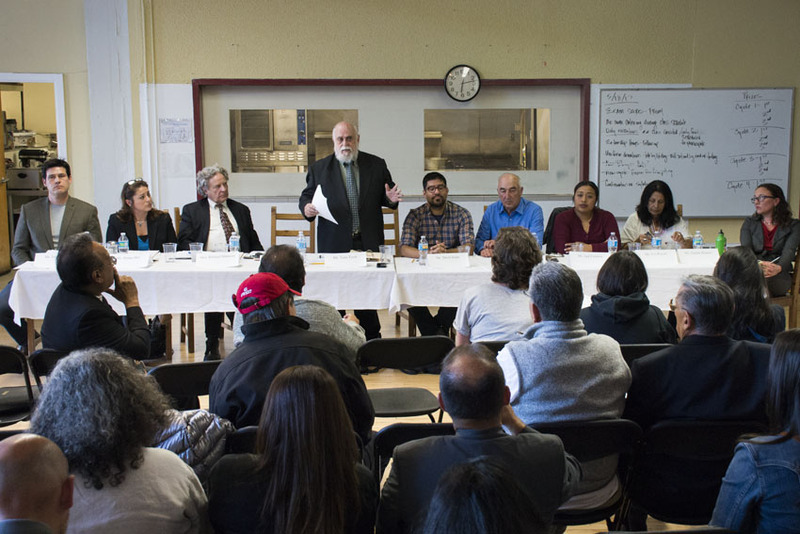 Neighborhood organizations are mobilizing to renegotiate a deal struck years ago – and recently upheld in binding arbitration – to save the Mission Language and Vocational School from what was then looming financial ruin. That 2013 deal, made with Huckleberry Friends, which promotes science and engineering education for youth, was a lease with an option to buy the leased portion of the building. When the Vocational School allegedly resisted the purchase in 2016, the tenant sued the school and the two parties ended up in binding arbitration. A settlement negotiated sometime in May by judge W. Scott Snowden seemed to be a done deal until Thursday, when board members met with other community groups to hear their concerns and indicated their willingness to go back to court and renegotiate. On Thursday night, board members said “nothing had been signed” and that a trial date will be set. In a closed session meeting immediately after the public meeting, the board voted unanimously not to accept the existing settlement and to go back to court later this year, while continuing negotiations in the interim. Up until recently, the board had resisted a full trial with Huckleberry because members feared a trial would result in serious debt. However, community activists have changed the board’s mind. The tenant, for his part, says he is still open to negotiating. 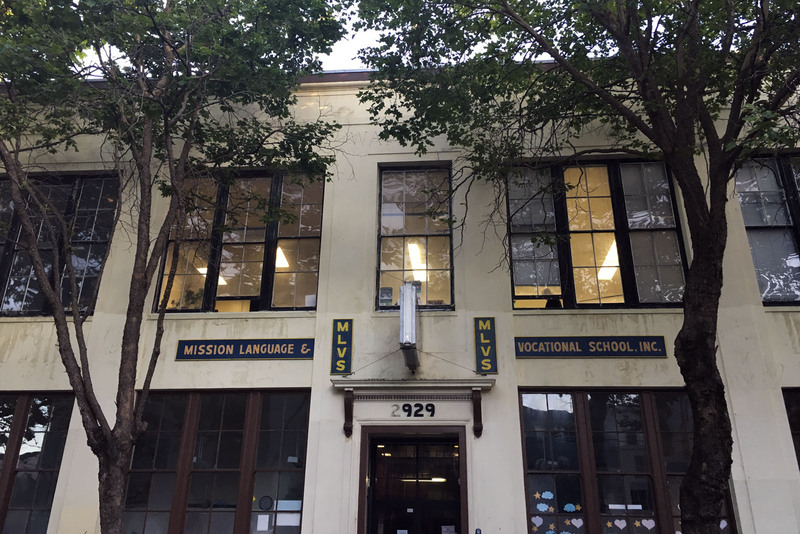 Those organizers – including Tracy Brown-Gallardo, Valerie Tulier-Laiwa and Miguel Bustos – maintain that they oppose the sale of any part of the vocational school’s 35,000 square foot building at 2929 19th Street between Alabama and Florida streets. They described the agreement to sign away part of it as a desperate but mistaken effort to save the school, and argue that the neighborhood now has enough professional and financial clout to negotiate a better deal with the tenant. The lawsuit stemmed from the alleged breach of a lease agreement in question, in which the school’s commercial tenant is exercising its contractual option to purchase part of the school’s property that it began renting in 2013. By doing so, the school would receive enough money to substantially pay off a $2.5 million loan it took out in 2014, and get back a sizable portion of what it originally rented out. Within the school’s leadership, some insisted up until the meeting that however difficult the original agreement, the school is contractually obligated to go through with the sale, while others said Thursday that the deal had not gotten the full board’s approval. The L-shaped building was once considered three separate buildings but is now one whole. Most of the longer portion facing Alabama Street was leased to Huckleberry Friends in 2013. At the time, the then-executive director of the vocational school, Rosario Anaya, and the school’s leadership needed funding to cover operational expenses and took out a loan secured by the building. Board members looked for help from other organizations, but found nobody able to give. “When we got into trouble, nobody came to help,” board member Ray Sloan told a group of activists a week before the Thursday’s board meeting. A new plan was formulated, to begin renting out commercial space in the building to other entities. To help attract one major investor, the school sought out someone who would be interested in renting a portion of the building and later buying it. Through a realtor, Anaya approached Saul Griffith and his venture Huckleberry Friends about becoming a commercial tenant in the vocational school’s building. About a third of the building was leased to Huckleberry Friends. Griffith also owns a building a block away and operates an engineering company called Otherlab focused on solving climate change and developing clean energy. The school’s lease with Griffith included an option to purchase a portion of the building facing Alabama Street, but that deal began to fall apart following Anaya’s death from cancer in August 2015. Because of the school’s financial difficulties, Griffith had agreed to co-sign the school’s new loan on the building, and the two parties set up a joint account. When the vocational school failed to make loan payments into the account, the bank went to Griffith as the co-signer. Griffith agreed to foot the bill for one payment, but ended up unwittingly paying rent as well as $250,000 toward his landlords’ loan. He had also been promised pro-rated rent for some improvements he was paying for, but was charged the full amount for months. The vocational school, too, said the situation caught them unawares, saying the person responsible for keeping track of the payments had failed to do so or alert the school when things went awry. “[Huckleberry Friends] tapped him on the shoulder and said, hey, how about that quarter million dollars you owe us? And that’s how we found out,” said Board member Michael Menesini on Thursday night. Conflict also arose over another tenant. The vocational school reportedly leased an entryway, already in use by Griffith to a charter school, The New School. After Anaya’s death, Judge Snowden’s early summary indicates, some in the school’s leadership started to express doubts about the deal to sell part of the building to Griffith. Meanwhile, Griffith was undergoing the bureaucratic process of splitting the property. The vocational school allegedly dragged its feet, though Menesini denied the school had impeded the process in any way. Snowden declined to comment on the current state of negotiations. In response, Griffith sued for the money owed and the failure to allow him to exercise his option to buy his leased portion of the building. The school made several arguments that their original contract with Griffith had been voided by new agreements and that the school had not been contacted by Griffith about the problems that had arisen until it was too late to act. The retired judge evaluating the case was, in an early summary of the case, unconvinced. The result was an injunction ordering the school to pay Griffith some $300,000 and not discuss further negotiations. Later, in arbitration, a new deal was reached that some members of the school’s board found favorable: More than 40 percent of the space rented to Griffith would be returned to the school. Griffith would also pay the school about $1 million, a sum worked out from what was left of the original $3 million sale price for his space minus damages and other factors. Griffith would also cover the costs of dividing the building into two separate properties. The parties would go their separate ways. The deal would have ensured the school would stay in good financial shape, board member Tony Fazio said last week. The alternative was going back to court and potentially being on the hook for attorney’s fees and much higher damages, and not having anything left to pay off the remainder of the still outstanding loan. But Thursday night, Menesini said negotiations had broken down. “The other side has moved the goalposts,” he said. Another board member, Eva Royale, said only a committee of the board was involved in negotiating the deal and others were left out. Menee Hill, Anaya’s niece and another board member, disagreed. Griffith, who last week characterized the agreement as a good deal for all parties, said he would be open to further negotiation. The cost of that deal, however, is too high for organizers who see the property in its entirety as a historical, cultural, and financial asset for the neighborhood. Many of the dozens who packed Thursday night’s board meeting said they had worked closely with Anaya, been students at the school or both. Around 150 students enroll in the school’s programs every year, and it boasts a job placement rate of between 70 and 80 percent. It has been in operation for more than 50 years, having developed out of the Centro Social Obrero founded in 1962. Regardless of its financial difficulties in the past, the school is performing well, Interim Executive Director Natalie Hopner said. Times have changed since Anaya developed the plan, the activists said. The Mission’s nonprofits are now heavily involved in real estate and much more financially capable. Spike Kahn, who founded the artist space the Pacific Felt Factory, pointed out that through peer-to-peer loans the neighborhood had already financed several property acquisitions easily totalling in the millions. If the vocational school turns to its community for help now, organizers said, the community has serious money and expertise to help out. “If it is just money, I will pour money on this guy to make him go away,” Kahn said. “We fight like hell over land that doesn’t even belong to us, like hell we’re gonna lose land that does,” said Gabriel Medina, vice president of the Latino Democratic Club and policy manager for the Mission Economic Development Agency. The latter is known for opposing large market-rate developments to push developers to provide community benefits. 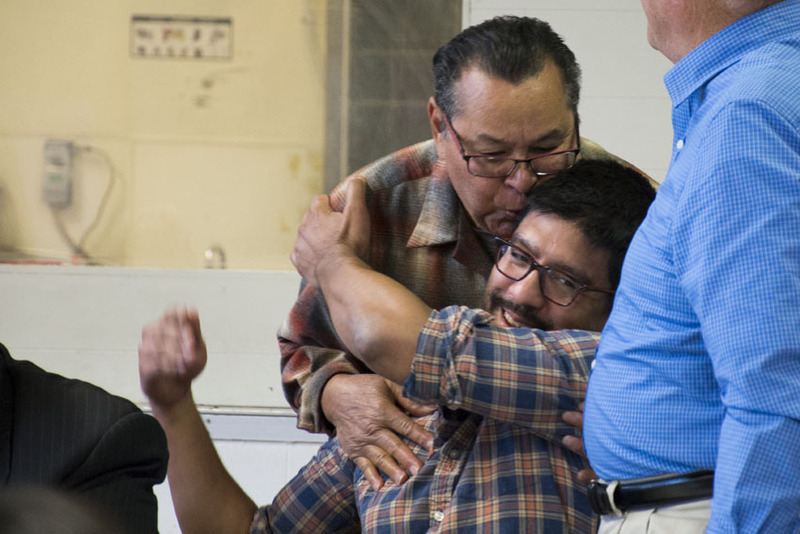 Ray Balberan, well known for his earlier work in violence prevention among youth in the neighborhood and other community advocacy work, went to each board member and embraced or kissed them. Much of the support, however, does not come without criticism of the management that left the school bound by a contract. “Please sit down and let us take over, because this is not working,” Kahn said. “Where is the Executive Director? He didn’t pay the loan for a year,” said Tulier-Laiwa at a separate gathering last week. According to the judge’s filing, the school’s past executives failed to make loan payments for a year and a half. Roberto Alfaro, who heads up the youth advocacy organization HOMEY, said the board could “do a better job” on transparency and suggested the board set up a community advisory committee so stakeholders could continue to give advice on future decisions. “We’re trying to support you, but you have to let us do it,” he said. Tulier-Laiwa insisted that the board consider adding five more members, selected by others in the community, to help bring new talent to the school’s leadership and steer it in a new direction. “The soul of this building belongs to the community,” she said. Board members Fazio said and Hopner both expressed gratitude for the feedback, before retreating to a closed session of the board to deliberate further. Correction: A previous version of this story referenced the school’s “mortgage” – it was a loan backed by the building, not a mortgage.